Results for - Who Decides Whether You Are Dead? 1. 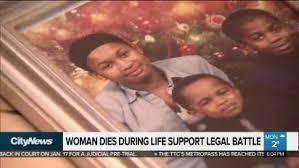 Maybe Brampton, Ontario's Taquisha McKitty died in September, 2017 at age 27, when she was declared brain dead after a drug overdose. Or maybe she died 15 months later, on December 28, 2018, when her heart finally stopped beating. The legal fight around the Brampton mother's diagnosis touched on everything that chills us about the ends of our lives, the chasm between modern medicine and religion and what happens to us when we're at the mercy of the system—and the arguments in this case eventually made their way to Ontario's highest court. The Brampton mother has spent more than a year in Brampton Civic Hospital's intensive care unit, while her family challenged the legal definition of death and fought to keep her on life support. The family had appealed a court's decision that would have seen her taken off life support, claiming the judge made several errors in her ruling and that her constitutional rights were being violated. The case was heard in Ontario's highest court early December and a decision was expected in coming months. Her parents launched a legal challenge arguing their daughter's Christian faith defines death as the cessation of the heartbeat, and that doctors should have to take people's beliefs into account before declaring them dead. Before the ruling came down, she passed away from "natural causes". Have you heard about this landmark case? 2. In another Ontario case, the family of an Orthodox Jewish man declared brain dead also disputed the finding and went to the courts. In that case, though, 25-year-old Shalom Ouanounou's heart later stopped beating and a Jewish doctor declared him dead. Have you heard about other cases where the definition of death was disputed? 3. 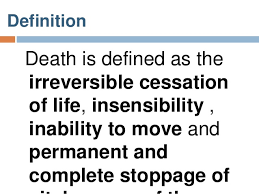 The legal definition of death is when an individual who has sustained either (1) irreversible cessation of circulatory and respiratory functions, or (2) irreversible cessation of all functions of the entire brain, including the brain stem, is dead. A determination of death must be made in accordance with accepted medical standards. This remains the standard of death in most religions. By the early 1980s, however, the medical and legal community also began to adopt a second definition of death—the irreversible cessation of all brain functions—and some religious groups have updated their beliefs. Where this gets disputed, is when the religious definition of death differs from the legal one. 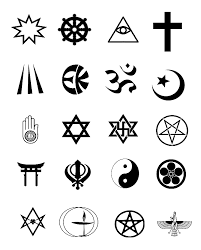 Are you aware of your religion's definitions of death?